The 45th Annual Fort Myers Boat Show, November 16-19, 2017 at the Harborside Event Center and the City Yacht Basin is shaping up to be the biggest show in the last several years. On the Caloosahatchee River, in the heart of the historic “River District” (myriverdistrict.com), this is just about the perfect setting for a show with a unique combination of indoor, outdoor and in-water display areas. You will find more than 500 boats, 160 accessory booths, 100 plus different boat lines, and a variety of how-to and boating information displays. With just about every type of boat imaginable, you will find inflatables, personal watercrafts, skiffs, bay boats, flats boats, center console boats, pontoon boats, deck boats, cruising boats, performance boats and much more. In water at The City Yacht Basin will be both new and brokerage boats of every description to nearly 80’ in length. From engines and electronics to docks and boat lifts, to all types of marine services to clothing and nautical gift items, and just about everything else you need on the water, you will most likely find it inside the Harborside Event Center or throughout the outdoor displays. Hours: 10 AM – 6 PM Thurs. – Sat. / 10 AM – 5 PM Sun. 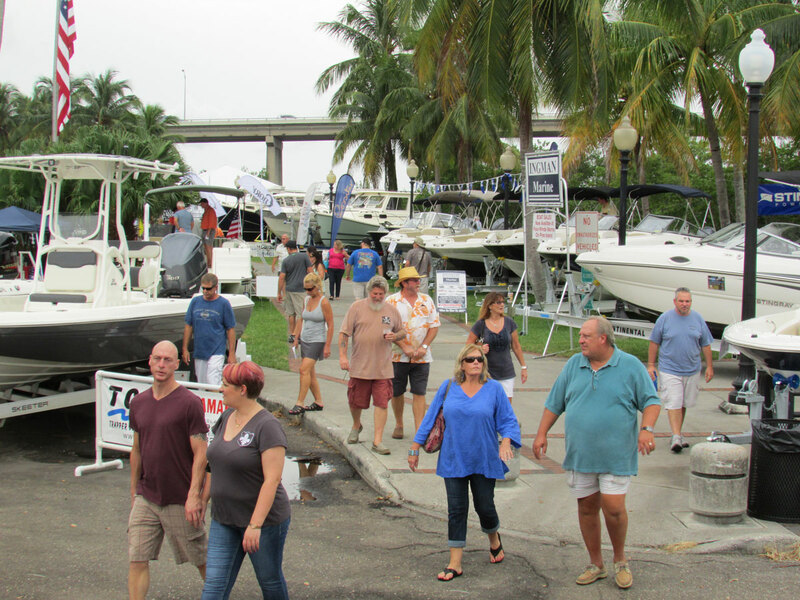 The Marco Boat Show is owned and managed by the Marine Industries Association of Collier County and is one of the largest premier recreational shows in the Naples-Marco Island area. The show will feature displays by Marinas, Boat dealers, and other marine related businesses. Quick SpA announces the acquisition of the business branch of the Italian company Item Mare, which manufactures MC2 anti-roll gyro stabilizers. This new product line will immediately become part of Quick Nautical Equipment’s portfolio, along with the existing lines of windlasses, thrusters, water heaters, battery chargers, and inverters. Manufacture of the MC2 gyros will be transferred to the Quick plant in Ravenna, Italy in January 2017 with the first production scheduled to ship in March 2017. Quick’s manufacturing plant was recently expanded by 7,200 sqm. to a total of 19,200 sqm. Quick SpA designs, manufactures, and distributes globally the Quick Nautical Equipment line, the marine water heater brand Sigmar Marine, and the LED lighting lines Quick Marine Lighting and Quicklighting. Sea Tech offers full service and installation of marine air conditioning systems including Split, Self-Contained, Reverse Cycle, and Chiller systems as well as, ice makers, refrigeration and dehumidification units. Serving Southwest Florida since 1999, we have the experience and resources to ensure your installation or repair is done right the first time! Sea Tech, with many years of experience as a Dometic/Cruisair and Webasto dealer has again expanded our service area. Recently adding to our staff a dedicated AC service technician in order to support the growing demand for AC and refrigeration service and repair in Collier, Lee, Charlotte and Sarasota counties. We at Sea Tech are dedicated to providing our current and future customers with the same high quality service for their climate control systems as we have with our other product lines. Please visit us at www.Seatech.net for further information on our products and services. Ask Us About the Sea Station Promotion! Come See Us at the Bonita Boat Show! Sea Tech welcomes Webasto to our ever growing line up of high quality marine products and accessories. Webasto, founded in 1901 manufactures a broad line of marine cooling and refrigeration solutions. We look forward to providing state of the art air conditioning systems to our valued customers. Come See Us at the Naples Boat Show! General 1-Day $10, Kids 12 and under FREE with a paying adult Parking: Free onsite parking No Dogs Allowed. Maintaining a stationary position while on the water presents numerous challenges for any captain, especially when fishing. SeaStar Solutions’ amazing new SeaStation™ GPS anchoring system meets those challenges head- on with the simple push of a button. What could be easier? SeaStation is an add -on system to SeaStar’s state of the art Optimus 360 joystick control system. SeaStation’s dual antenna GPS sensor provides input to the Optimus 360 controls to automatically hold a vessel’s position, heading – or both, depending upon the need. a designated position on the water. To keep these adjustments smooth and passengers comfortable, the algorithms are designed to minimize engine shifting, engine rpm and steering movement. The captain can further reduce SeaStation’s throttle and shift adjustments by favorably positioning the boat with regard to wind and/or current in order to take advantage of natural forces. SeaStation affords the captain three distinct modes (patent pending) of operation. Setting up on an underwater reef, rock or wreck typically requires several steps, including gauging wind and current in order to drop anchor in just the right spot to then drift back over the reef or rock. When wind and current are going in opposite directions, it’s practically impossible to hold a good spot for fishing, even using an anchor. In the “position hold” mode, the boat will hold its position as it maintains its natural heading given wind and current. In other words, the boat will hold position, but its heading may change as it is affected by wind or current, resulting in less work by the engines and steering system. Drift fishing is another challenging example. When wind and current are at odds, the boat will tend to drift and spin, making it difficult for the fishermen on board to keep lines straight as they move around from port to starboard and back again. The same holds true for kite fishing. When the boat spins and drifts , kite lines get tangled. In other words, it gets messy in short order. In the “heading hold” mode, SeaStation will hold the designated course heading.The boat holds its course heading, with the bow pointed in the heading direction, while allowing the vessel to drift with wind and/or current. The “heading and position” mode will hold a boat in one spot without spin or drift. This mode will be particularly useful when fishing around a buoy or other fixed structure, or while waiting for a bridge to open or for a spot to open up at the dock. SeaStar’s proven Optimus 360 joystick control system for boats with twin, triple or quad outboard motors is at the heart of the new SeaStation feature. Optimus 360 provides forward, reverse, diagonal and even sideways boat movement via input from a joystick controller. When combined with a compatible autopilot, Optimus 360 also provides directional control based on autopilot/GPS input. SeaStation expands on this capability by controlling steering and thrust to maintain a specific position, countering the effects of current and wind. SeaStation’s dual antenna GPS interfaces directly with the Optimus 360 system via a devicenet CAN harness. needed to fine tune the system to assure optimal control and performance. SeaStation should not be engaged if people are swimming, diving or anywhere in the water around the boat. any of SeaStar Solutions’ full range of steering and control products, please visit www.seastarsolutions.com. The 44th Annual Fort Myers Boat Show, November 17-20, 2016 at the Harborside Event Center and the City Yacht Basin is shaping up to be the biggest show in the last several years. On the Caloosahatchee River, in the heart of the historic “River District” (myriverdistrict.com), this is just about the perfect setting for a show with a unique combination of indoor, outdoor and in-water display areas. You will find more than 500 boats, 160 accessory booths, 100 plus different boat lines, and a variety of how-to and boating information displays.